In this post we will see How we can Connect Android to MySQL Database using mysql-connector.jar. You can download Jar Library using this Link. Note : I’m not using any type of Webservice or other web api library. You can always name your Package and Application name according to your requirements. 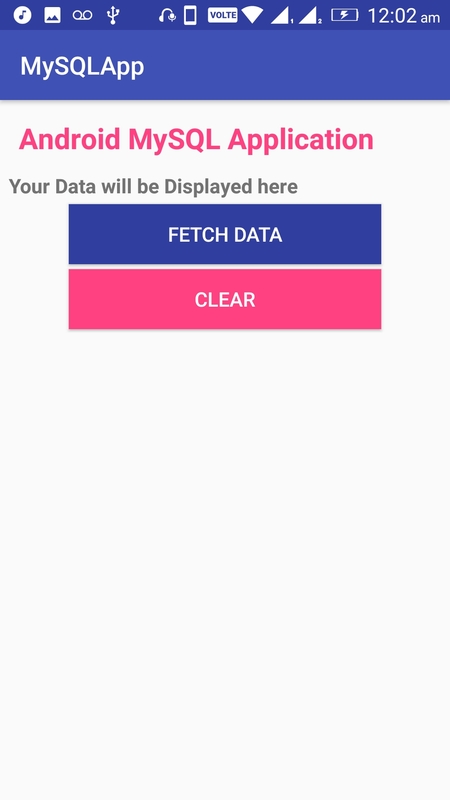 Application will first try to connect with the MySQL Database and on successful Database connection, android application will display data from a table on a Android TextView. It will connect via IP address of the Database with a correct Database Credentials. android:text="Your Data will be Displayed here"
The layout contains a Android TextView to show our Table data from MySQL Database and two buttons, one for connecting to Database and other for clearing the TextView content. url,user,pass must be valid and correct credentials of your mySql database for a successful Android-MySQL Connection. 192.168.0.192 is my Laptop’s IP Address and 3306 is my Port number to connect on. Make an Android ASyncTask. This will accept the command and try to connect with your Database and on successful connection with MySQL assign a String variable with the table data. And now run your application. On Pressing on the “Fetch Data” button it will fetch Data from MySQL Database table. Note : If you are on personal Laptop or PC with WiFi router connected to it and your Android Device connected to the same router, it will work, i.e. It must be same network to work in. If your Database is out your Device’s network, it will not work. Also, if you are using Cellular Data network, your Database must be on Internet and it should be able to be connected remotely. Android Bind ListView to MySql Database table. How to Connect Android with MS SQL Database. Android Send SMS Programmatically with Permissions. Making Phone Calls in Android.